Here we are going to learn about how we can add fields to an existing pivot table without disturbing the previous data in the table. To find the difference and sum of values. 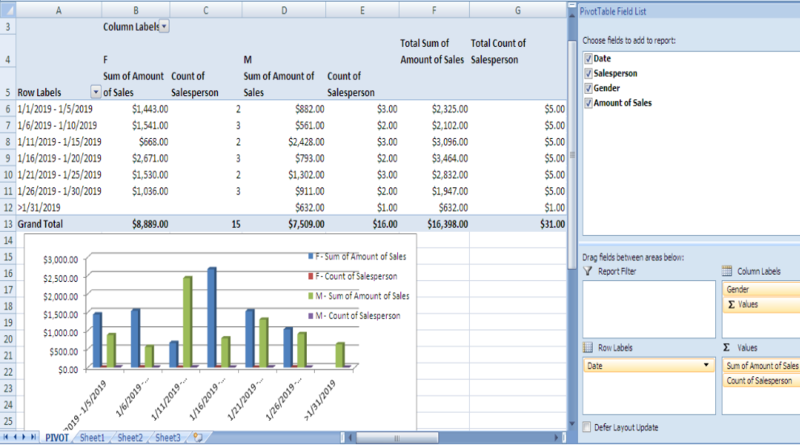 To calculate the percentage of values/amounts and so on. 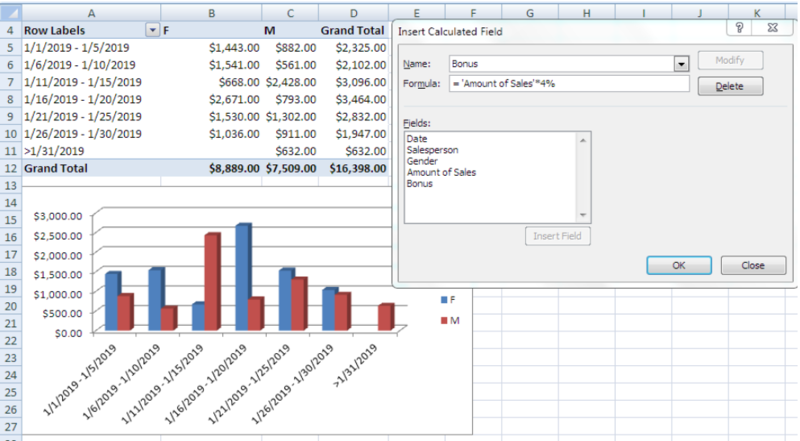 Here we are going to add a field in the pivot table that already exists in the “Pivot Table Field List”. Click on the table for the field list. Select the field “Salesperson” and it’ll appear in the “Row Labels” column. We’ll carry it to other columns one by one with a left click to decide where the added field suits the best. We have placed the field in the “Values” column. 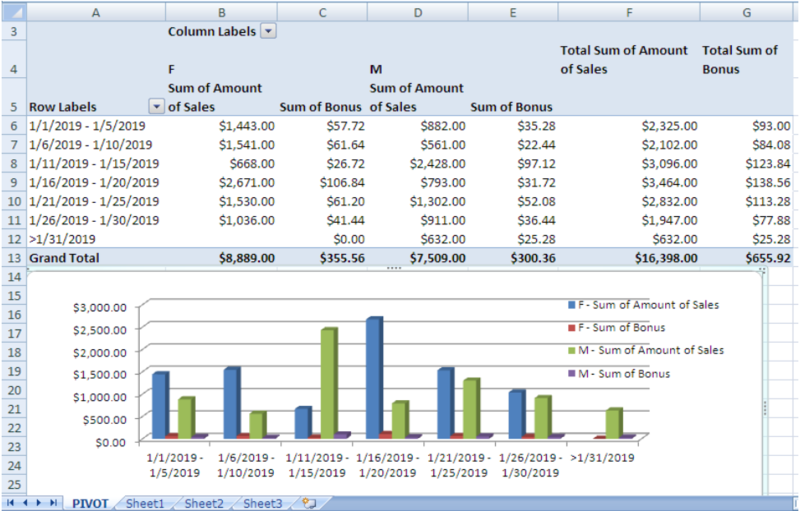 Excel automatically added it to the pivot table showing the total of males and females in front of their sales for 5 days. The chart also changes according to the new addition in the table. 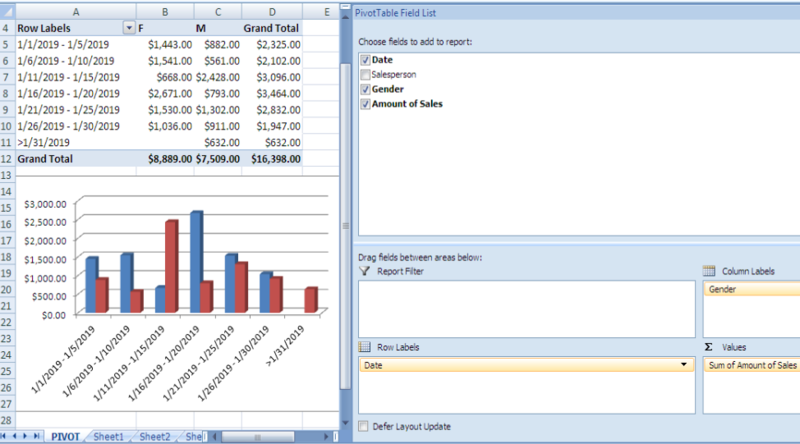 Select a cell in the Pivot table and click on “Options/Analyze” tab. Click on “Calculations/Formlas” in the “Tools” section and select “Calculated Field”. A small window will appear. Write name of the field and click “Add”. Then write the formula according to the new field’s requirement. Here we have written =Amount of sales*4% as we want to calculate 4% bonus on sales. On clicking OK, we’ll get a new field of “Sum of Bonus” as seen in the picture given below. Visualization of the new field can also be seen in the chart. The new field can be removed easily by a right click on any cell of the field and clicking the option “Remove Sum of Bonus”.